We’ve been getting a lot of questions in the forums and in our Twitter and Facebook pages about some economic reports and why forex traders think they’re important. Worry not, young Padawan. They’re easy enough to understand if you look at the big picture. First, you have to remember that the price of a forex pair is simply a reflection of the pair’s supply and demand. The evaluation of a country’s economic, social, and political dynamics influencing the demand for the currency is called Fundamental Analysis. 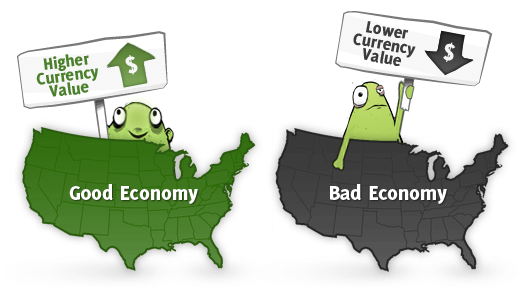 Generally, a positive outlook for an economy translates to higher demand for its currency. For example, a decrease in the U.K.’s unemployment rate would usually lead to more demand for GBP. Fundamental analysis gets tricky when all the factors stated above get into the mix. For newbie-friendly purposes though, we’ll focus on the main drivers of an economy’s growth (demand side) and the common monetary policy terms (supply side) you need to know about. Read it, memorize it, tattoo it on your wrist! DO NOT FORGET THE GDP FORMULA! When reading GDP reports, take note of the components that have increased/decreased the most, as the central banks are likely to keep close tabs on them, too. GDP is usually measured on a quarterly basis, though you can also see monthly, annual (comparing against the same period of the previous year), and in the case of the U.K., three-month (comparing months 2+3+4 against months 1+2+3) figures. Unemployment rate: The ratio of able and willing workers who can’t find employment over the total number of workers in the work force. The lower the better. Employment change: The net sum of all job gains and job losses from different sectors. Gains in full-time employment are preferable over gains in part-time jobs, as they provide more stable income for potential consumers. Labor participation rate: The number of workers in the work force who are either employed or are actively looking for work. Participation rate goes down when workers are disheartened over their job prospects. Jobless claims: The number of individuals seeking unemployment benefits. The U.S. measures the initial claimants on a weekly basis, while the U.K. counts them on a monthly basis. Non-farm payrolls (NFP): The number of workers in non-farm-related jobs. The report also excludes those who work for non-profit organizations, private households, and government agencies. Removing jobs from these sectors provide a better picture of the health of “average” jobs in the U.S. and their potential impact on consumer spending. Inflation is the increase of overall prices of goods and services over a period of time. Central banks constantly try to influence inflation, as it affects the value of their local currencies. For example, high inflation means that businesses would need less money to pay their lenders but that consumers also would need more of their local currencies to buy the same set of goods and services. Meanwhile, consistently low inflation limits wages and investment outlook and could stunt overall economic growth. Inflation rate: The rate of inflation. Usually measured on a monthly basis and often compared to the same period in the previous year. Core inflation measures prices without the impact of volatile items such as seasonal food and oil prices. Consumer price index (CPI): The most common measure of inflation. It’s basically the weighted average of a set basket of goods and services, usually measured on a monthly basis. Personal consumption expenditure (PCE): The Fed’s preferred measure of inflation. Unlike in CPI computation, the PCE price index considers the consumers’ reactions (e.g. substitution) to previous price changes. It also uses a chained index comparing the current quarter’s price to the previous quarter instead of assigning a fixed base as the CPI does. Trade balance: The sum of an economy’s exports and imports. A surplus means that the value of exports had exceeded imports while a deficit means there are more imports than exports. Forex traders pay attention to trade numbers because, aside from contributing to the GDP, export and import figures also reflect the impact of other issues such as export demand from major trading partners, currency strength, and global commodity prices. Current account balance: Think trade balance++. Current account calculates the net foreign assets of an economy. Aside from trade balance, it also factors in the net income (loss) from foreign investments as well as net current transfers of money. A current account surplus means that the economy is “lending” its assets to the rest of the world, while a deficit suggests that the economy is “borrowing” assets from the other economies to finance its economic activities. Remember the GDP formula above? Businesses make up the Investment (I) part, which is why their activities are important for central banks and forex traders. Purchasing managers index (PMI): Similar to business confidence surveys, PMIs are simply surveys of purchasing managers from a specific industry. Questions include their outlook on new orders, employment, and production and supplier deliveries. Readings of 50.0 and above usually imply optimism and future industry expansion, while readings below 50.0 denote pessimism and possible industry contraction. Industrial/Manufacturing production: Measures the output of the industrial and manufacturing sector. These reports represent actual production figures instead of purchasing manager outlook. Watch out for production trends, as they could influence business sentiment! Durable goods orders: A measure of the volume of orders and shipments of items that have a normal life expectancy of three years or more. Rising equipment demand suggest that businesses are investing and could lead to more production and employment in the foreseeable future. On the other hand, falling durable goods orders hint at gloomy business sentiment and possible layoffs for some industries. Going back to the GDP formula above, consumers influence the Consumption (C) part of the equation. Potential consumers can have steady jobs and wages but not spend if they have a gloomy outlook on the economy. Retail sales: An estimate of the total sales of goods and services purchased by consumers. Core retail sales takes out volatile factors such as oil and seasonal food prices. Details of retail sales reports usually include the industries and commodities that contributed the most (or dragged on) the overall figures. Consumer confidence: Like in businesses, consumer outlook is also important for market players. Consumers won’t spend as much for goods and services if they think that they won’t have a job or that the economy would deteriorate in the next 12 months. Popular consumer confidence/climate/sentiment releases include surveys conducted by the University of Michigan (UoM), Zentrum fur Europaische Wirtschaftsforschung (ZEW), GfK, and the Conference Board (CB). Building permits: The number of authorizations given by the government or other regulatory bodies before any new or additional construction-related activity. A rise in building permits could signal increased employment and activity in the construction sector. Housing starts: The total number of new residential construction projects. Usually released with building permits numbers. Home sales: The number of either new or existing home sales over a period of time. It is usually released on a monthly basis and could signal trends in the housing market. Mortgage approvals: The number of home loans approved by an authorized regulatory body. As in building permits, more approvals hint at economic optimism and increased employment and activity in the industry. House price index: A tool that measures changes in the values of single-family homes over a period of time. The reports don’t usually include new houses or construction, and can hint at housing demand in specific areas. All of the reports above have their parts to play in calculating the DEMAND for a currency. Central banks, however, mostly try to influence economic activities by controlling the money SUPPLY. Interest rate: One of the major tools available to central banks. Interest rate is the rate that the central bank uses to issue short-term loans to domestic banks. Low (or negative) interest rates aim to encourage borrowing and economic activity, while high interest rates aim to restrain market players from firing up the economy too quickly. Forex traders live and breathe interest rates and interest rate speculations. For one, they also represent the rate of return for holding the local currency. One of the most popular ways to make money trading forex is to take advantage of interest rate differential, which involves buying currencies with high interest rates against a lower-yielding one. Meeting minutes: A piece of paper detailing the whys and the hows of the latest central bank decisions. Usually released a few days after the central bank’s monetary policy announcement. Pay close attention to the factors that led the central bankers to their decisions, the dissenters, and the overall bias (dovish or hawkish) of the bank. Required reserve ratio (RRR): Another tool for the central bank. It’s the percentage of deposits and other liquid assets that commercial banks must store, either in its own institution or with the central bank. Central banks tend to set RRRs higher if they want to limit economic activity and lower them if they want to stimulate borrowing in the economy. Quantitative easing (QE): Also known as asset purchases. It’s a central bank’s way of stimulating economic activity, usually by buying government bonds and high-rated private assets. There you have it, folks! Hope this little list helps you in identifying the economic reports you need to watch out for and the potential impact their results can have on currency price action. Don’t forget to practice by checking out our forex calendar!